This week I have started experiencing some new vision problems. My hubby usually drives our daughter to school in the mornings because of my eyes being sensitive to lights. This makes it hard for me from the oncoming cars especially in the rush hour traffic. I avoid driving in dim light or in the dark if I can help it. For the most part, I usually ride with him while we take her to school and look away whenever my eyes bother me from the lights. On Thursday and Friday mornings, I had to drive because hubby couldn’t make it. I know the lights would affect me so I took my time and drove. I always try to look towards the right at the white line so that the lights would not blare at me so much. I found out soon enough that new problems crept in. The headlights of the cars further down the road had the same effect on me (as if they were asterisks with long lines). 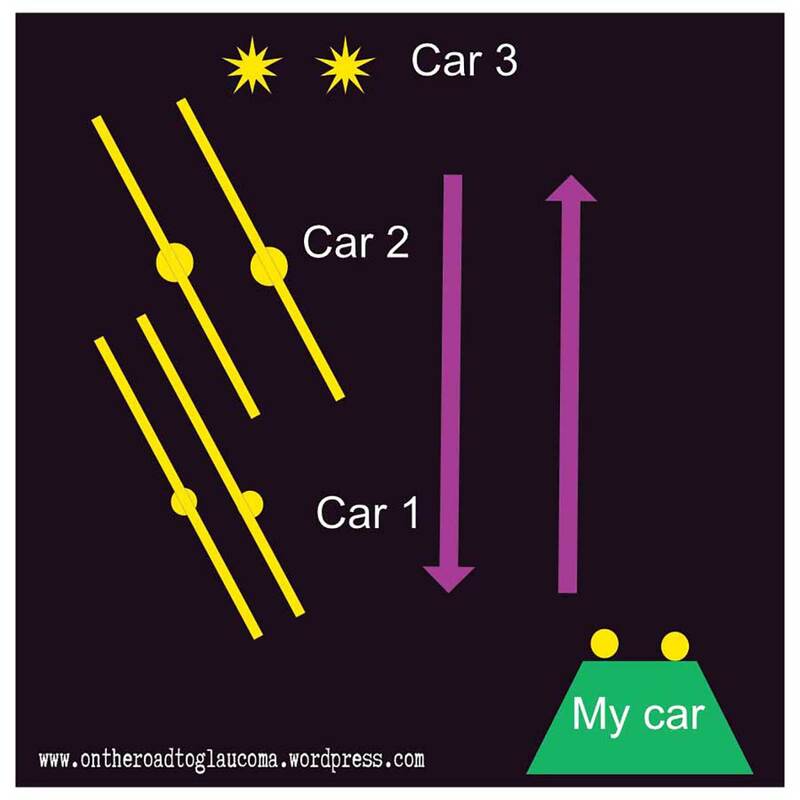 The new problem was that the lights from the cars that were closer to me were creating diagonal parallel lines of the beams. I have illustrated it in the graphic on this page. The front cars had lines that were much closer than the ones behind. It seems sometimes that the lines merged into one line but if I stare a bit to it, I could tell that they were coming from both headlights. The hard part is that the lines seem to go across my windshield on the driver’s side. It is a bit scary and I tend to drive with my hands grasping the wheel a bit tighter. I am scared of being in an accident. I have tried to find out from my support group on Facebook but no one had that effect happen to them. Some do have the star effect but none with the diagonal beams of light. It seems as if I may have to make another appointment with my eye doctor if this continues. Someone suggested that it could be cataracts and I cannot ignore that fact because my family also has history with cataracts as well as glaucoma. Cataracts are more common in my family though. I only have one brother who has glaucoma and cataracts as well. He is now blind in one eye. My past examinations have not shown any cataracts but I may have to ask my doctor to do a test. Keeping my fingers crossed.